It’s that time. 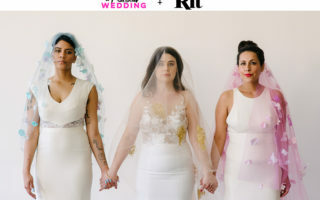 It’s May, which is usually the time that those of you getting married in the summer or the fall realize that, Holy Hell, this wedding is about to happen, and it’s time to lock down all the little things on your to-do list. I started this post with the intention of reminding you that as you’re scrambling to find a hair or makeup person that you suddenly realized you want to hire, or a florist, or a baker, or a musician, or a day-of coordinator, or the officiant you have yet to nail down, or… you name it, the APW vendor directory is here for you, with its awesome vendors who believe in this site and what it stands for, who believe in you, and who want to bring their magic to your wedding. But as I was putting this post together, I dug back in the archives to four years ago, to see what I was going through at this particular juncture. I knew I was in the weeds of the details: buying booze, figuring out makeup, figuring out timing and setup. (We’ve got a lot of that covered now in our How To section, because I have straight up tried to create the resources that I wished I had at the time.) But what I found in the archives was actually terror. May, four years ago, I was wondering what our wedding meant, and what marriage meant, and if I could have a wedding that reflected who we were, a wedding that would be a symbol of a marriage that reflects who we are. That post, and the one about my worries around makeup and feminism are good reads (and talk about emotions I’d forgotten). And four years later, living in a little house with a little baby, I was overwhelmed by reading those posts. I realize now that by facing those fears, I was able to answer them. Our wedding was wonderful, and full of who we were. Our marriage is better. Four years ago I said, “But now, as the invitations go out, and the wedding becomes not just our thing anymore, I’m scared that the power of ‘how things are done’ will overcome ‘how we are doing things.’” That was the right fear. The answer is to keep facing it every day. So. Your last-minute wedding worries might run a little on the existential side. Or maybe you still need a bouquet. For the former, see above. For the latter: The APW Vendor Directory. And now, I throw it to those of you in the trenches of wedding planning. What are your joys and fears right this second? What are your logistical hurdles (or hell, your fears about logistics)? Questions and answers in the comments.